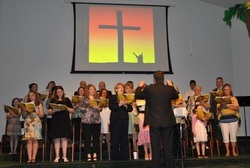 Our choir consists of men and women from our church membership who are committed to worshiping God through practicing their musical talents on Wednesday nights at 7:00pm and helping point the Sunday morning congregation to the One who is worthy of our praise. This group of believers deliver an Easter and Christmas cantata which often includes drama. A talented group of musicians who use their gifts with piano, organ, drums, and guitars to honor God and help lead our congregation in worship on Sunday mornings. 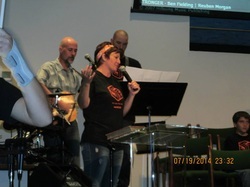 Their musical talents allow our congregation to worship with hymns and contemporary Christian music. This group does not meet on a regular basis, but blesses us with their enthusiasm for God and music by presenting musicals on special occasions. They often deliver two musicals a year to complement what the adult choir does. Under the guidance and direction of Amy Curry, we have a group of youth who choreograph and perform stick routines to music in a way to tell a story. Quite a joy to see God moving through young adults in a way that points people to Christ and what He has done for us.